Gel Spice Mustard Powder 5 Lb | Food Service Size by Gel at The Flavour Stack. Hurry! Limited time offer. Offer valid only while supplies last. 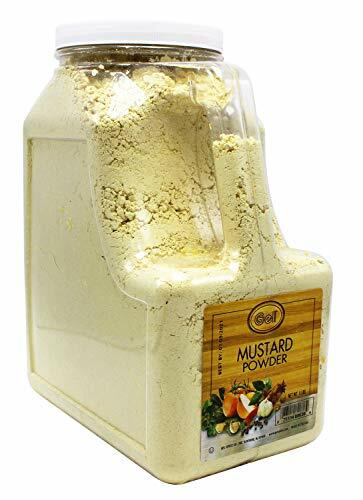 Mustard Ground is processed from the whole, clean seed of Brassica hirta, with the hulled ground and not removed, with none of the fixed oil removed. View More In Mustard - Page 4. Mustard Ground is processed from the whole, clean seed of Brassica hirta, with the hulled ground and not removed, with none of the fixed oil removed. Said product shall have a bright yellow to greenish yellow color and a very pungent aroma as well as bite. Product shall be free of defects and decay and shall comply in every respect with the Federal Food, Drug and Cosmetic Act. Blend with water and add to recipes or blend with other seasonings such as crushed chiles or cracked pepper to enhance the flavor. If you have any questions about this product by Gel, contact us by completing and submitting the form below. If you are looking for a specif part number, please include it with your message.